60% of seoClarity customers upgraded from another SEO platform. With simple, easy-to-understand pricing provide upfront, seoClarity offers a client-driven roadmap with two-week product release cycles to keep up with the fast pace of change within the search landscape. seoClarity doesn’t simply collect data. It delivers AI-powered insights to scale your SEO program. Experience advanced machine-learning uncover insights with battle-tested framework and dedicated support team to boost your results. Covering more than 90 countries with a mobile-first data-set approach, see changes to search visibility in real-time, powered by the world's largest, community-contributed keyword research database with unlimited downloads. No other database compares. Leverage the power of deep-learning to power your content performance with an AI content writer and understand an entire topic faster than ever before to create authoritative content and expand your audience reach. We do not add limits just to add limits. 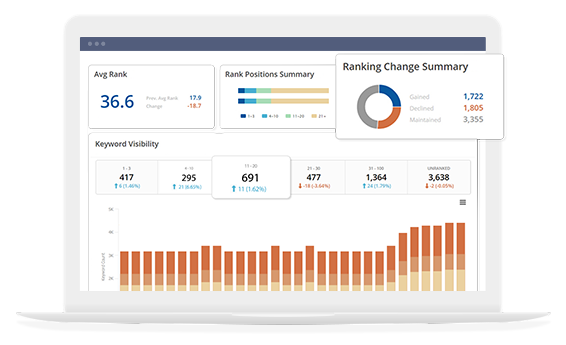 With all packages, it includes unlimited competitors, no limits on number of crawls and number of pages crawled, limitless reporting with customizable dashboards, and more! "Not only is Clarity very powerful with its default functionality with competitor tracking, but you're also able to build custom views with that data."